If your dog is an average American canine, there is approximately 50% likelihood that your dog has a chronic disease that increases chances of osteoarthritis, heart disease, respiratory disease, kidney disease, chronic pain, cancer, high blood pressure, and endocrine disease. In addition, this disease is also known to significantly decrease life expectancy. The most unfortunate aspect of this condition is that it is completely preventable, yet only a small fraction of dog owners take the necessary precautions to prevent this disease of malnutrition in their dogs. This disease is canine obesity. Unless you avoid all news and cultural commentaries, you are likely aware of the human obesity epidemic in America and other countries around the world. According to the report, “F as in Fat: How Obesity Threatens America’s Future”, a collaborative work by Trust for America’s Health (www.healthyamericans.org) and the Robert Wood Johnson Foundation, as of 2010, 68.7% of American adults over 19 years of age were overweight or obese (“Overweight” is defined as a body mass index, or BMI, over 25 and “Obese” is defined as a BMI over 30 - BMI Calculator). In addition, the rapidity at which the increase in human obesity has occurred is alarming. In 1980, no state had an obesity rate (BMI over 30) above 15%. In 2013, 41 states have an obesity rate that is at least 25% and 13 states have an adult obesity rate above 30%. However, the report also brought some hopeful news. In 2012, adult obesity rates stayed level in nearly every state (except for an increase in Arkansas) after a 30-year annual increase. Though there is significant merit to Dr. Ward’s claim, the causes of increases in canine weight over the past thirty years are likely multifactorial. In a 2010 study of British dog owners and their dogs, several risk factors were significantly associated with canine obesity. Dogs of older age, spayed female dogs, dogs fed snacks or treats monthly, dogs that exercised less, dogs with older owners, and dogs with low income owners were all more likely to be overweight or obese. 59% of the dogs in this study were classified as either overweight or obese (similar to the percentage of overweight or obese American dogs). Though some of the risk factors for canine obesity make intuitive sense (exercise level and snack feeding), other risk factors linked to canine obesity were not so obvious. Despite this, the authors of the study stated that “factors specific to the owner such as their age, income and the amount of exercise they can give their dog are more influential than dog-level factors such as breed, age or neuter status in canine obesity.” So, it appears it may be up to us humans alone to keep our dogs lean and healthy. The weight status of the owner may also be a risk factor in canine obesity. A 2010 study in the Netherlands found that the BMI of the owner was significantly associated with the degree of obesity in their dog (Nijland and others 2010). However, this association did disappear after correction for time spent walking the dog. As may be expected, this suggests that the shared exercise and calorie burn of the pair determines the degree of obesity in both the owner and dog. Thus, supporting the expected result that not only will your dog get skinnier with frequent walks, but you may too! An interesting finding in this study that may disappoint my veterinary colleagues is that veterinarians were not found to have significant influence on the correlation between dog owner BMI and the degree of overweight of the dog. However, this will not likely come as a surprise to most practicing veterinarians as keeping weight down in their patients is often a frustrating and fruitless pursuit tempered by an owner’s desire to build and maintain a relationship with their dog through food and the modern lifestyle that leaves less time for physical activity. One of the largest challenges for veterinarians in the pursuit of leaner dogs is that owners may not even realize their dog is overweight! In a 2011 study of British dogs and their owners, only 53% of owners correctly identified their dog as overweight and even more concerning, 39% thought that their dog was an acceptable or normal weight (White and others 2011). The investigators noted that owners frequently had a narrative to explain or justify the reason that their dog was overweight. Whether these results are due to justification related to the owner’s guilt or true ignorance of their dog’s condition, the result is millions of dogs worldwide that are not living to their full potential. Just like their overweight human counterparts, overweight dogs suffer from many chronic diseases associated with their size. Type-2 diabetes, osteoarthritis, cardiorespiratory disease, high blood pressure, and certain cancers have been documented to occur more frequently in obese dogs over dogs with normal weight. An eye opening study in 2002 showed that Labrador retrievers fed 25% less than a control group of Labradors were significantly leaner as expected, but also lived a median life span that was 1.8 years longer than the control group (Kealy and others 2002)! Given that a Labrador average lifespan is about 10-12 years, this is approximately a 15-18% decrease in life expectancy for the overweight Labradors. In order to gain some perspective, if we use the 2011 average American human life expectancy of 78.6 years from the US Centers for Disease Control (www.cdc.gov), an equivalent decrease in human life expectancy would be 11.8 to 14.1 years! Though genetics likely play a role in both human and canine obesity, the genetic links to canine obesity are complicated and not well described. A 2013 study expressed the need for discovery of genes responsible for canine obesity (Switonski and others 2013). However, this venture is complex, expensive, and time consuming. Despite many genetic studies on human obesity and identification of multiple genes associated with obesity, the combined effect of all of these genes only account for about “2-4% of the total heritability of common forms of obesity” (Palou and Bonet 2013). It is theorized that most people have a multifactorial cause to their obesity including multiple genes and the genetic interplay with environmental influences (diet, exercise, lifestyle, etc.). The beauty of identifying obesity genes in canines (unlike in humans), is that since we typically control the breeding process in our purebred dogs, we could use genetic information to pick appropriate mates and thus, decrease predisposition to the overweight condition. That being said, environmental factors will still weigh heavy (pun intended) on our dogs’ body conditions regardless of what the genetics tell us. The more we learn about obesity and the genetic predisposition to the condition, the more complexity we are likely to uncover. However, the tried and true historical mantra of nutritionists and physicians to eat fewer calories and become more physically active is sound, effective advice that can be easily implemented for our pets (and ourselves) regardless of our genetic backgrounds. With all the love, companionship and trust our canine partners give us, don’t we owe it to our dogs to keep them at a healthy weight and maximize their quality of life? Kealy RD, Lawler DF, Ballam JM, Mantz SL, Biery DN, Greeley EH, Lust G, Segre M, Smith GK, Stowe HD. Effects of diet restriction on life span and age-related changes in dogs. J Am Vet Med Assoc. 2002 May 1;220(9):1315-20. Degeling C, Burton L, McCormack GR. An investigation of the association between socio-demographic factors, dog-exercise requirements, and the amount of walking dogs receive. Can J Vet Res. 2012 Jul;76(3):235-40. Courcier EA, Thomson RM, Mellor DJ, Yam PS. An epidemiological study of environmental factors associated with canine obesity. J Small Anim Pract. 2010 Jul;51(7):362-7. Nijland ML, Stam F, Seidell JC. Overweight in dogs, but not in cats, is related to overweight in their owners. Public Health Nutr. 2010 Jan;13(1):102-6. White GA, Hobson-West P, Cobb K, Craigon J, Hammond R, and Millar KM. 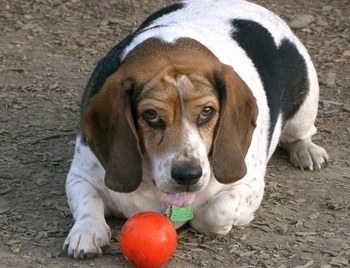 Canine obesity: is there a difference between veterinarian and owner perception? J Small Anim Pract. (2011) 52, 622–626. Switonski M, Mankowska M. Dog obesity – The need for identifying predisposing genetic markers. Res. Vet. Sci. (2013), http://dx.doi.org/10.1016/j.rvsc.2013.08.015. Palou A, Bonet ML. Challenges in obesity research. Nutr Hosp. 2013 Sep;28 Suppl 5:144-53.